on purple? I have a lavender swing. I love your blog so much!! thank you so much.. I'd like to buy some of these pillows... please e-mail me or find me on etsy (whodatcrafts) and tell me how I can! Where can I purchase these pillows? Your pillows are wonderful! I just bought some oilcloth over the weekend and received it yesterday. I got pink with white dots...love it. Great minds think alike!! I can't wait to make something with it. Thank you for sharing. found this site by accident and love everything about it. the oil cloth pillows and two would be great in pink even better or red or what ever.....how do i see about this??????? Wishing you a great day and a romantic night. Yes, oh so VERY cute and YES YES, where did you find these great patterns in oil cloth?? Share, please! Love the pillows! What a great combination of colors. Gosh, are we ever glad you are back to blogging. I, like everyone else, was beginning to have withdrawals. The pillows are so cute! Glad you are back, Tina! 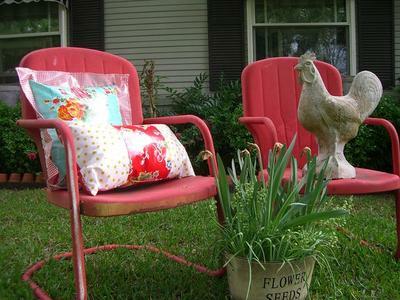 I love the oil cloth pillows! They are so CUTE! I also love your Blog. Thanks! Where do you find such cute oil cloth fabric patterns? The stores where I see it usually just have generic gingham patterns or something equally boring. I LOVE these pillows! Is oilcloth what I would call vinyl tablecloth fabric? I think so. I think it would be great outdoor fabric, what about the heat when it is hot? I love the way they look, and can't wait to see the pink. You are missed when I don't see a blog post for a day or so. glad your back. Lucinda and I loved seeing you in Canton. what a great booth. we get all giddy when we walk in. better than new shoes feeling. we`ll stop by again. I love oilcloth! It's so durable and perfect for outdoors. Lovely color and patterns choices and a darling blog. I finally got up the nerve to send you a comment. You have the cutest blog ! I just LOVE it ! I love it so much that it inspired me to start one LOL . 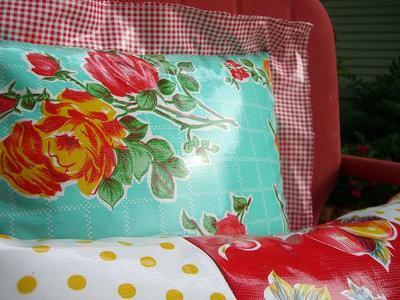 The oilcloth pillows are a wonderful ideal . Do you sell them ? They are adorable. I will have to try that myself. My neighbor Walli ran across a nice outdoor iron table and four chairs last year around the corner at a garage sale. I snapped them up, but the chairs needed recovering. So I took the seats out, made a quick trip to Hobby Lobby, purchased some weatherproof fabric that looked like vines running through leather fabric (all dark brown), and stapled those babies on. I repainted the chairs a nutmeg, and the chairs are holding up beautifully. Always love your eye candy! 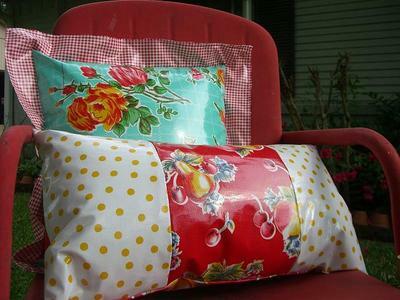 I just never thought of oil cloth to use for outdoor pillows....these are precious. Where does one find such cute ones? There's a Rooster Parade going on...you need to enter your rooster! Send the pic to me and I send them on to Beverly at How Sweet The Sound...she is putting it all together. Her first INSTALLMENT was posted this morning...such cute ones on there. What a fabulous idea! The colors are perfect and so practical! Glad to see you back. I was having withdrawals. Love the pillows. I keep seeing oil cloth and my scatterbrain never would have thought of using them outdoors. Perfect! I want to see that pink pillow! I love oil cloth! Oooh pink! I love pink and have some mixed in with my patio stuff! I might have to have that pillow. Where you get the oilcloth pillows? So Cute! I love that mix of fabrics and made out of oilcloth - perfect for outdoors! Did you make them?